Sacha La Forgia With an interest in science but a desire to work outdoors rather than in a lab, Sacha La Forgia decided that studying winemaking would provide the best career path to satisfy both interests. Graduating from the University of Adelaide in 2011, Sacha didn’t wait until finishing his studies to hit the vineyards. During his degree he did five vintages in Australia and overseas and followed this up with two years of travel, working on another seven vintages. While in Italy he met Bepi Tosolini, the owner of a grappa distillery in Friuli, who inspired him to start his own business. Sacha realised that the small-batch gin-making industry was on the verge of taking off and jumped in with both feet, launching the Adelaide Hills Distillery in 2014. He’s already seen some remarkable success in the short time he’s been in business, with three products – the 78 Degrees Gin, a companion orange bitters and a white-spiced rum – winning gold, silver and bronze at the recent San Francisco World Spirits Competition. Sacha is grateful to have his formal education behind him and says that building his technical palate through tastings while at university was one of the most important skills for his career. Sacha has also called upon his university contacts to help him through difficult times. One of these is his former lecturer, Associate Professor Graham Jones, who helped Sacha to analyse and problem solve a technical issue he encountered at the distillery. “It was great to be able to call upon his expertise, otherwise I would’ve lost all my hair,” he laughs. 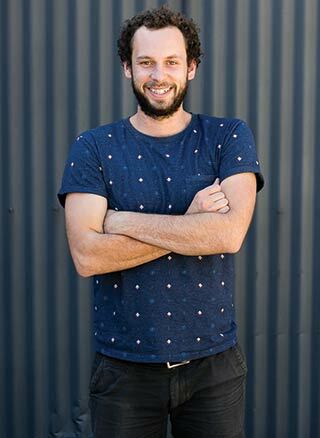 Sacha is now looking forward to expanding his repertoire into whiskey and has teamed with other local small-batch producers – the Hills Cider Company and Mismatch Brewing – to launch a full-production facility to house cellar doors for the three craft beverages. Opening in early 2017, the luxury beverage hub will be the first of its kind in Australia, offering local hospitality and an educational experience where visitors can learn about making gin, beer and cider.